I’ve notice that this little pot of gold has been quietly taking over beauty blogs the last few months. After enduring months of chatter I really had to know what all the fuss was about. This post is for my friend Rachael aka Ms. Mixie who will forever be my lip balm partner in crime. My little glass pot of magic arrived late last week. I immediately opened the package because I really had to know what all this chatter was about, I could not contain my excitement. I was instantly in love with the packaging– its housed in pretty glass container. I opened the lip balm and it looked like shea butter, white-ish and opaque, I was worried it would leave a white cast on my lips like Blistex. After I put it on I checked myself out in the mirror– not white cast– just super moisturized supple healthy looking lips with a little bit of gleam. The lip balm itself really coats your lips in this vinyl pants sort of way comfortable but tight- what I mean to say is the lip balm is NOT going anywhere. Its packed with honey, shea butter, grapefruit essence and plant oils and was even tested in the extreme Canadian cold. While it may actually be summer I love a good effective lip product that does not dry out your lips. This is that product. The gleam on your lips is super pretty and the moisturizing effects are really spot on. Even though I didn’t really need to, I kept putting it on all afternoon. And while it has grapefruit essence in it I would say its decidedly more lemon-y. Basically I completely understand what all the fuss is about, this stuff by Nuxe is pretty amazing. 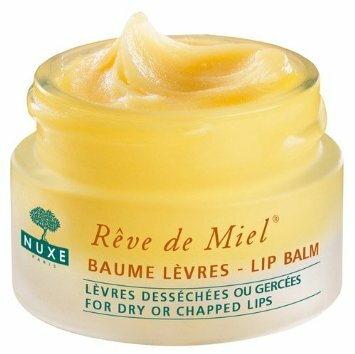 Find NUXE Reve de Miel Lip Balm HERE.